Five years ago, singer-songwriter Teddy Sinclair faced a creative roadblock in her major label deal with Interscope. After releasing two pop albums under the alias Natalia Kills, she knew she had to part ways with the music that felt more like an impediment than an emotional release. She knew it was time to play by her own rules. Cruel Youth was born from the twisted and beautiful minds of Sinclair and her husband, Willy Moon. The result is both celestial and menacing. It is art in its true form — the purest expression of what it is to be human and what it means to be Teddy Sinclair. Her voice is powerful, and it poisons its listeners with personal, uncensored truths that may come as a shock to the system. A dedication to her vices, +30mg (released September 07, 2016) is a cohesive masterpiece that tells a story from start to finish. Though it possesses an eeriness only found within the darkest corners of a nightmare, this EP is actually the materialization of Sinclair’s unmatched jubilee. It is her unapologetic declaration of her true self. She seems to extract every ounce of human emotion from inside of her and construct them into a sonically tangible painkiller meant only for herself, but abused and enjoyed by the rest of us. The EP opens with a sentimental piece that that incorporates a voicemail by Sinclair herself. Titled “Everything Was Beautiful,” it relates the events of an unforgettable night as both a lingering memory and a foreshadowing of the events inspiring the next track, “Alexis Texas.” Sinclair does not hold back in this next suggestive and sexual song as she recalls a night of firsts with her husband. “Mr. Watson,” the band’s debut single off the EP, is a love song (more or less) to narcotics, personified. An ode to her drug of choice, it is a moving piece that illustrates the sheer dependence, desperation, and emotional indifference towards the outside world caused by Mr. Watson. On the other hand, the next track, “I Don’t Love You” is a song of apathy towards a past lover. It’s mournful, but it’s matter-of-fact. This song is a testament to Sinclair’s character. She knows exactly what she wants and when it is time to move on from someone or something that has nothing left to offer. “Florida Blues” is an audible high and places the listener in a dreamlike state; it is sort of an escape from the painful truths in the rest of the EP, but it is short-lived as the next track brings us back to reality. “Hatefuck” takes its listeners back to a time of insecurity and desperation. Sinclair sings of an emotionally disconnected relationship, one in which she is used purely for the physical aspect. Finally, “Diamond Days” (previously featured by Atwood Magazine) is a proper closing of the EP. It is a farewell to the glory days that celebrated her vices. Sinclair seems to have experienced personal growth throughout the entirety of the EP, something that only authentic art can bring out of its creator. 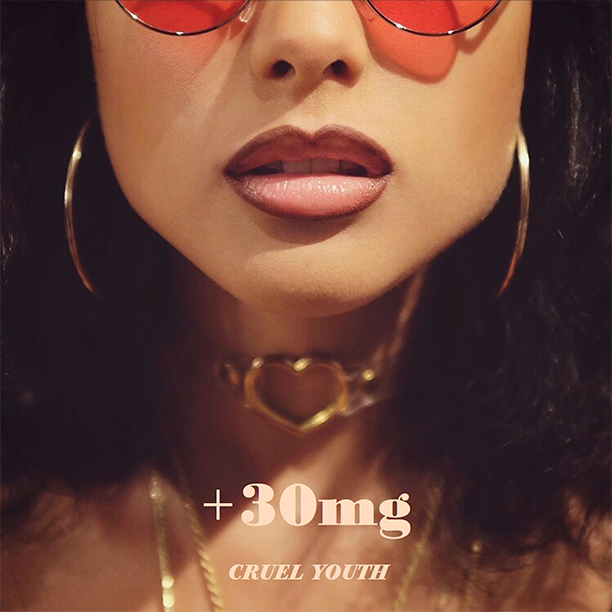 Poetic, cinematic, and overwhelmingly addictive, +30mg is the perfect prescription of Cruel Youth, and it will have you begging for your next dose.